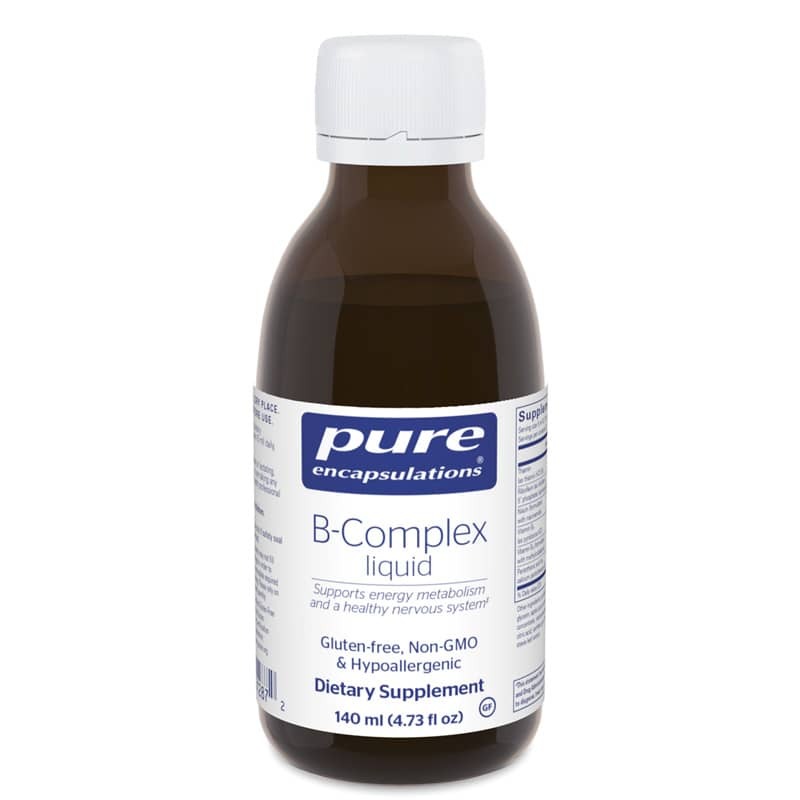 B-Complex liquid offers a comprehensive blend of B vitamins packed into a convenient liquid delivery form, designed to support cellular, cardiovascular, neurological and psychological health. B vitamins play important roles in nearly all of the physiological systems in the body. Some of the key supportive roles include nutrient and energy metabolism, as well as production of DNA, hemoglobin, neurotransmitters and hormones. Optimal levels of B vitamins have been associated with cellular, cardiovascular, neurological and psychological health. B vitamins are essential to basal mitochondrial function as metabolic coenzymes, playing a key role in energy production and nutrient metabolism. B vitamins also play a critical role in promoting DNA synthesis and healthy methylation. Methylation is a key regulator of genetic expression and cellular function. Healthy methylation is vital for cellular health, DNA synthesis, hormone and neurotransmitter production and energy metabolism. B vitamins act as cofactors and methyl donors in a variety of key biochemical reactions occurring in blood cells, neurons, the vasculature and many other tissues. Other Ingredients: purified water, natural vegetable glycerin, apple juice concentrate, strawberry juice concentrate, natural lemonade and orange flavors, citric acid, xanthan gum, potassium sorbate, purified stevia leaf extract. Adults: As a dietary supplement, take 1 teaspoon daily, with a meal. Shake well before using. If you are pregnant, nursing or have any health condition, please consult your healthcare professional before using this product. Keep out of the reach of children. My doctor suggested that I take this. My NP has me taking this B complex. It works great and gives me what I've been looking for. I feel this product works as well as others I've tried and the taste is not offensive as some.